Everyone is excited about Machine Learning right now. Everyone’s getting into it, talking about it, and describing how their products and services will make use of it. It’s also being considered the future of computing by a number of companies and many pundits. It’s basically the most talked about future technology right now, alongside AR/VR. I think there’s a major omission in this cast. I think Evolutionary Algorithms are going to have the same (or similar) impact to Machine Learning, and potentially much more. 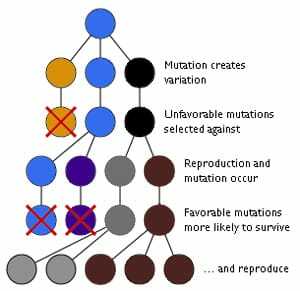 So what is Machine Learning and what are Genetic Algorithms? Machine Learning is where you train a computer to learn by feeding it data. Give it enough data and it can learn all sorts of things, like how to identify human faces or translate languages. Evolutionary Algorithms attempt to model the power of evolution (descent with modification combined with natural selection) in order to quickly build solutions that are superior to anything we’ve ever had before. So, both are ways of solving problems. In one you feed a student with data about the world, and it learns. In the other, you have a model of how the world works (nature) and you create mutation and reproduction and test the offspring against the model you have of reality. Machine Learning already works for many types of problems, and is being adopted widely. Evolutionary Algorithms are far more limited in practical application right now, but it’s my prediction that once they reach a tipping point similar to ML, they could prove every bit (and even more) powerful. The key is 1) quickly producing high-quality solution mutations, and 2) having effective models for reality to test them against. Descent with modification combined with natural selection is arguably the most powerful natural force we’ve ever encountered. If we can figure out how to model these appropriately, and we can leverage our scaling technologies the way we have with Machine Learning, I believe Evolutionary Algorithms will surprise everyone with the impact they’ll bring. I’m not an expert on Machine Learning or Genetic Algorithms. My prediction above is based on reading a couple of books, a couple hundred articles, and intuition about scientific research vs. media enthusiasm.